The party was a success. The birthday boy was happy with the food and everything I tasted was great (I didn’t taste the two shrimp dipping sauces because, well, I don’t eat shrimp.) I continue to have this lingering feeling that I didn’t make enough food but my husband, who has a healthy appetite, assures me there was enough. I had a lot of fun catering this party and not just because the clients are such good friends. I made a nice mix of tried and true recipes and new-to-me recipes. I chose a mix of things that could be made ahead and things that needed to be made day of. I stuck to my daily task list and never felt overwhelmed by what I had to do. And once I spent an hour or so finishing everything up at their house, I was able to walk out of the kitchen and enjoy the party. I’ve made these dates probably 10 times now and am always blown away by how much people like them. I think the only person who doesn’t rave about them is me. I don’t really like dates but I love how easy this recipe is and the fact that the filling can be made a day in advance. You can find the recipe in this post – scroll to the bottom. Here is another recipe I have made many times. You are basically guaranteed rave reviews. My friend Lauren said the tomatoes tasted like sunshine. 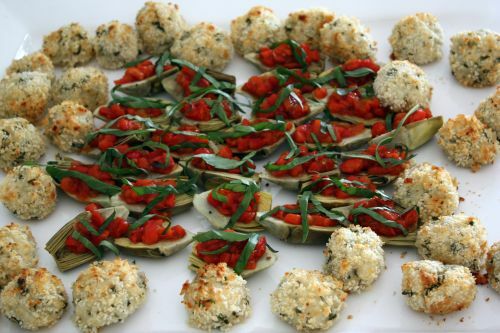 Another one you can make well in advance and just assemble before serving. You can find the recipe in this post. I was really happy with how both dishes on this platter turned out. Neither of which I had made before but both I will make again. 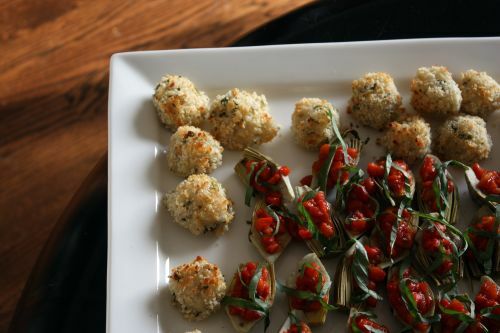 Roasted Artichokes with Red Pepper Relish and Oven-Fried Rice Balls with Gruyère. I could easily have eaten about half the rice balls on that platter – they were that good. I made them the night before and just let them rest in the refrigerator on a baking sheet. They tasted incredible just out of the oven but were still good after sitting out for an hour or so. 1. Preheat oven to 450°. Heat the olive oil in a medium saucepan. Add the shallot and garlic and cook over moderate heat until softened, about 4 minutes. Add the rice and cook, stirring for 30 seconds. Stir in the water and bring to a boil. Cover and simmer over moderately low heat, stirring occasionally, until the water has been completely absorbed, about 10 minutes. Scrape the rice into a bowl and let cool to room temperature. 2. Stir the Gruyère, 1/4 cup of the Parmesan and all the chopped herbs into the rice. Season the rice with salt and pepper. 4. In a shallow bowl, toss the panko with the remaining 1/4 up of Parmesan. Dredge the rice ball in the panko crumbs and transfer to a large baking sheet. Bake the rice balls in the upper third of the oven for 25 minutes or until golden and crisp. Let stand for 5 minutes then transfer to a platter and serve. 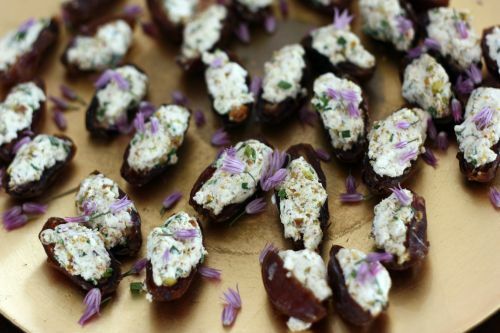 I make stuffed dates all the time w/ mascarpone cheese and maple syrup w/ pistachios on top. Everyone loves them! Your party platters look beautiful! Wow, that is a lot of delicious food. Everything look just SUPERB! Once a year, I throw a huge party during the holidays. It’s a cocktail party, with just drinks and appetizers. I’m always struggling to find the perfect balance of little bites to make–these look fantastic. I’m definitely going to be trying the dates and the tomatoes. They look delicious, and simple too! Sounds like a great party! The rice balls look delicious. They look like they would be addictive, little snacks! From what I can see, looks like the party was a total success! The food looks icnreadible! I love dates, so I probably would have eaten improper amounts of those bad boys, and the tomatoes… well, you’d have had to kindly ask me to leave some for the other guests! Great recipes! the tiny foods look so, so cute! Love them. So pretty. Love the lavender (or whatever that little purple flower is) on the dates…what a colorful touch. Don’t do too much party food around here lately, but this may inspire a little summer celebration. All looks so delicious! We went to a party the past week-end and the food was not as pretty as yours. Everything you made is so professional looking. Oh wow everything looks amazing!! Ohhh snap. 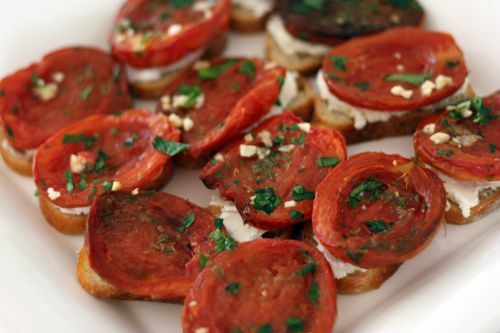 All of these appetizers look great! The tomatoes are just gorgeous. I’m really interested in the date recipe. I’ll have to make a date with it. Heh heh heh. I love dates. can you use a different type of cheese for the rice balls, I do not have gruyere?